You are working on a group project. One person in the group is not doing their fair share. How do you handle the situation? Speak with others in the group and then decide how to proceed. Let a more experienced person in the group deal with it. You have been invited to an event you do not particularly wish to attend. How do you respond? Speak with other invitees before choosing what action to take. Not attend and go boating instead. Attend but bring plenty of alcohol and food to liven things up. Attend but play practical jokes at the event for my own amusement. Go if it would hurt someones feelings if I didn't attend. Your friend has something in their teeth. How do you tell them? I give them some wine to flush away what is stuck in their teeth. I spray salt water at their face until it is gone. I tell them they have something stuck in their teeth. I let someone who knows them better be the one to tell them. I wait until nobody is around and then I tell them. I reassert the established norm that people should not have things in their teeth. There is 1 donut left in the box. You haven't had one yet. How do you respond? Put hot spices on the donut and let someone else eat it. Ask others if it is alright if you have the last donut. Leave the donut and order in sushi. Allow someone else to have the last donut. Wash the donut down with a glass of wine. You are on a road trip with several Greek Gods. One of them is manipulating the radio and annoying everyone else. How do you respond? Politely ask the person if it is alright if others choose the radio station. Put in place a rotating system where all Greek Gods get a turn to select the music. Whoever buys the wine controls the radio. Complain that the older Gods listen to terrible music. Change the station to whatever you want. Your friend forgot your birthday last year. It is their birthday today. How do you respond? Politely tell them they forgot your birthday but wish them a happy birthday still. Pay for their drinks at the bar. Forget the situation and eat a fish sandwich. Do not wish them a happy birthday. Give them a birthday card which says they are older than they really are. Human figurines made out of clay. A sign that reads "Private Property"
Life preservers and an anchor. The most well-known Greek God and the God of War, Zeus. Zeus is the King of the Gods and the leader of all leaders. Based on your answers, you too show the capabilities to be a leader of all leaders. The son of Zeus is a good looking but mischevious fellow. He regularly serves as a messenger of the Gods as he is able to travel between realms so easily. Hermes is a bit of a practical joker as well, he has a great sense of humor but others sometimes tire of him. You are Dionysus and you like to party! You are the result of Zeus' affair with a mortal woman and as such you enjoy spending time with mortals as well. In fact, you can often be seen drinking and making merry with humans and mortals alike! You just like to party! A wise leader, you are the God of forethought. Your knowledge and wisdom helped you mold humans out of clay. Unlike Zeus, however, you grew attached to the humans and have often butted heads with Zeus over their treatment. You are a wise and caring soul. You are the God of the Sea. While others focus on the heavens or Earth, you are satisfied with your life at sea. That's probably for the best. The gods on Earth and in Heaven seem pretty competitive. You are the God of the Underworld Hades. There is some debate over how cruel a God Hades was. While he was the God of the Underworld, he was said to have been fair in his punishment. It might be the case that you are fair as well but you are still driven by the negativity in the world, which makes you closest to Hades of all the Greek Gods. There is a Greek God watching over you and parts of your personality are actually governed by which God it is. Gods in Greek culture are plentiful and diverse. There is one who fits you to perfection, however. 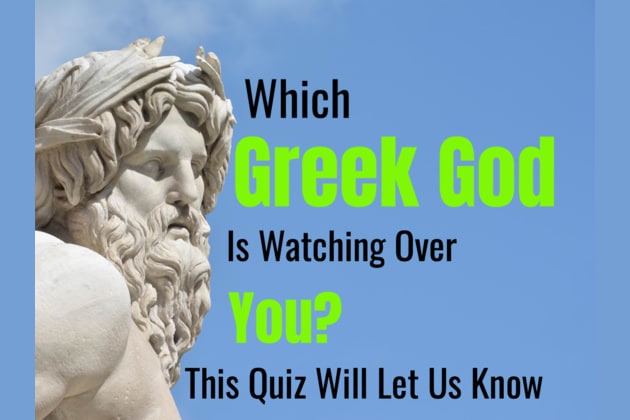 Take this test and we will determine which Greek God is watching over you.